These brownies turned out better than I thought they would! As with any experimental baking, there is always going to be times where something doesn’t quite turn out as you had expected or hoped. I have had many flops in my day. You’re more than likely going to think the same thing as it’s coming together and as it’s baking. But to my (and hopefully your!) delight, they turned out to be quite delicious! The coconut oil that bakes and puddles a bit on the top appeared to help keep the inside fudgy, but also help to create a crispy outside. 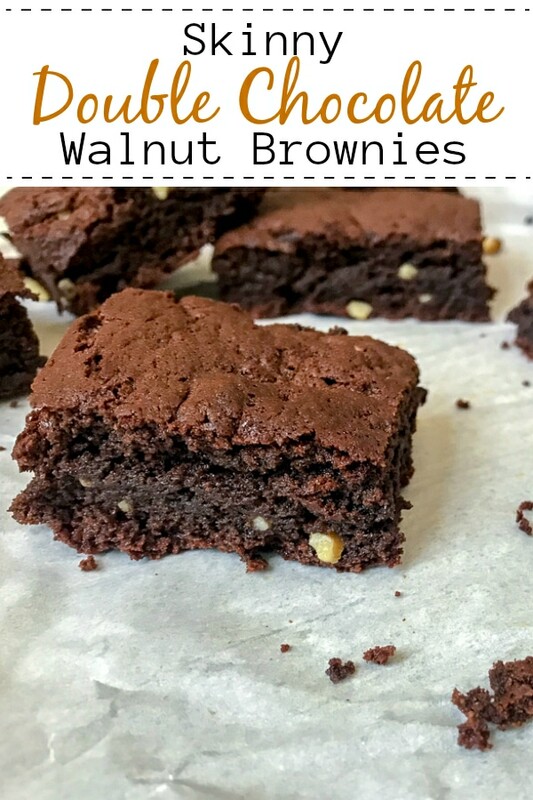 Which in my book – makes for the best brownies! And I am one that loves the edges?! Of breads, cakes, and especially brownies? I’ll take the corner or end piece of something any day! 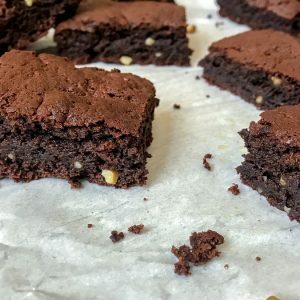 So if you’re an edge lover like me, then these are the brownies for you! 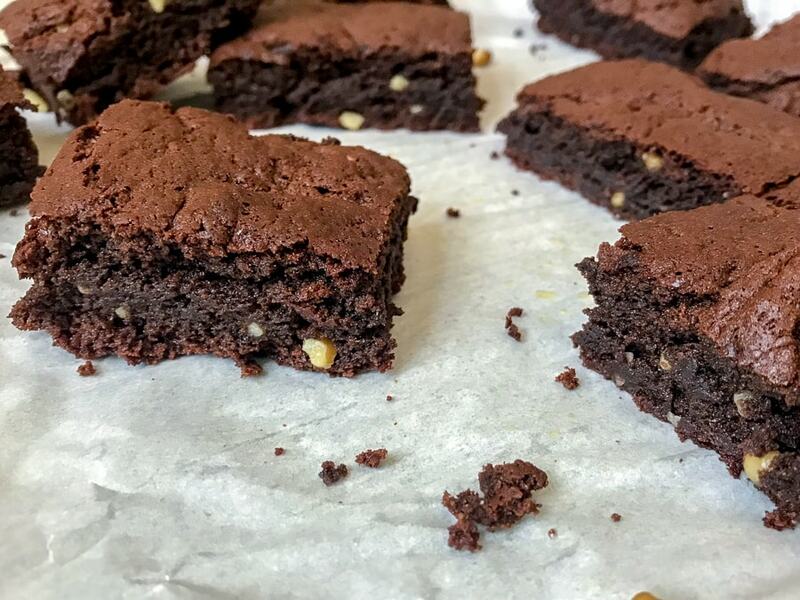 These brownies are made with coconut oil. You can replace it with vegetable oil, butter or even applesauce. But I have not tested them with these options, so I’m unsure if butter or (especially) applesauce will give them the crispy outside. Applesauce is a wonderful oil replacer, though! Use equal parts for replacement. Almond butter is a key ingredient in this recipe, but you can also replace it with peanut butter. I used natural almond butter. Be sure to line a 9×9 baking sheet with parchment paper. This helps to keep the brownies from sticking (especially if you’re substituting with applesauce). Easy to remove from the pan, cut, and serve without the mess! 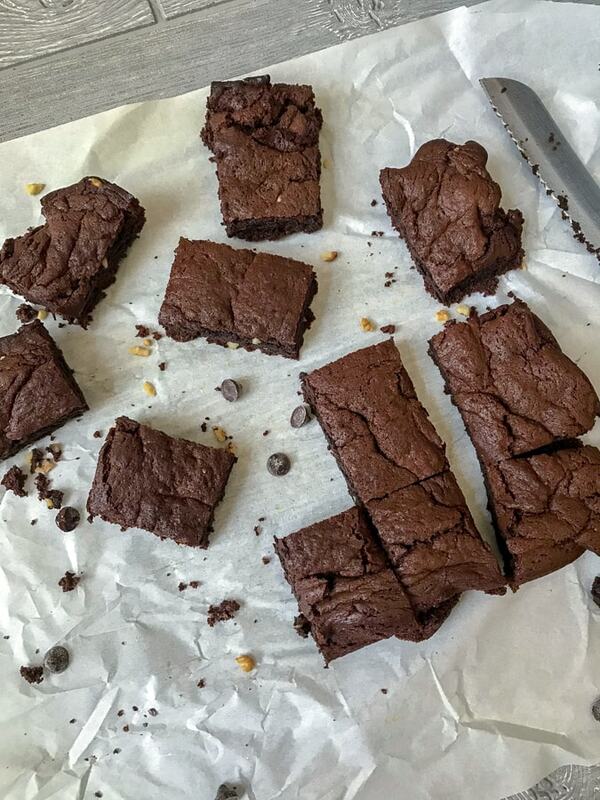 The best part about these brownies? They are only 289 calories per slice! Hopefully you’re not like me and you stick to one brownie when it comes out of the oven. HA. Of course I had to eat this one I was done taking pictures. Which only added to my taste bud joy. 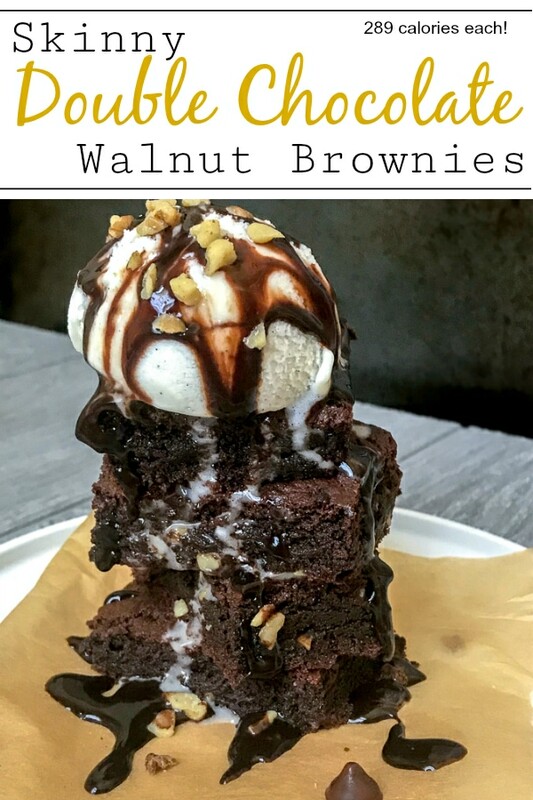 Served with vanilla bean ice cream, hot fudge, and extra walnuts? Perfection. I tell you. Pure chocolatey perfection. 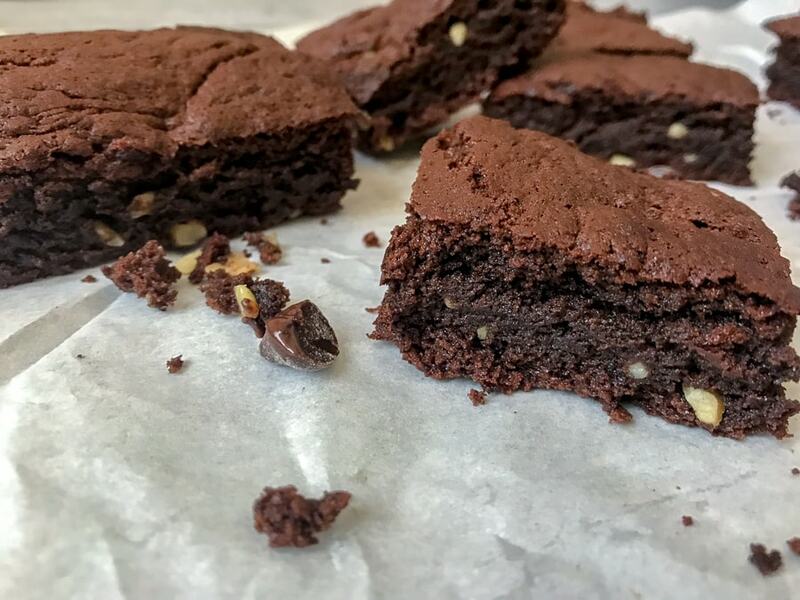 Skinny Double Chocolate Walnut Brownies - crispy on the outside, fudgy on the inside. 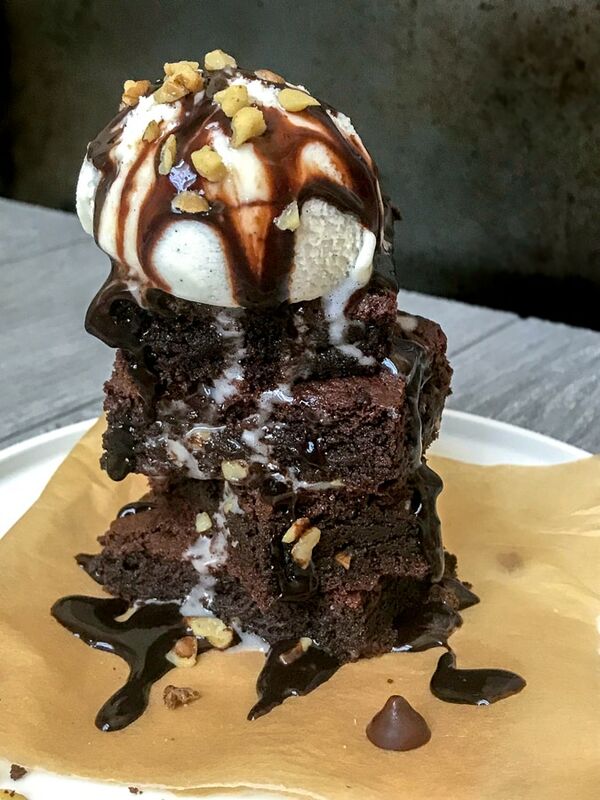 Just like a brownie should be! These are the ultimate brownies when it comes to being low-calorie, super chocolatey, and easy to make. Preheat oven to 350 degrees F. Line a 9x9 baking dish with parchment paper. You want to not only line the inside, but have extra to fold over the handles or edges of the outside for easy removal. Place the chocolate chips and coconut oil into a small sauce pan over low-heat. Allow the chocolate to melt, stirring occasionally to incorporate it with the melting coconut oil. As the chocolate and coconut oil are becoming friends, place the following ingredients into a stand alone mixer (or mixing bowl if using handheld): almond butter, honey, brown sugar, vanilla extract, and egg. Once the chocolate and coconut oil have melted and combined, remove from heat and allow to cool slightly. To a separate mixing bowl, combine the cocoa powder, all-purpose flour, baking powder, baking soda, and salt. Mix well. Add the melted chocolate and oil to the almond butter mixture and whisk to thoroughly combine. Once combined, add the dry ingredients followed by the chopped walnuts. The mixture will start to get super thick. Pour/add the mixture to the prepared baking dish. I find that using the back of a spoon to be the easiest way to not only spread the mixture out, but to also control the parchment paper. Place into the oven to bake for 25-30 minutes. Check at 25 minutes with a toothpick. It will remove relatively clean (going to come out with a little chocolate as its supposed to be fudgy). Allow to cool for a few minutes prior to removing from the dish. Simply grab the parchment paper from both sides and lift. Best if served warm! *As noted in my posting, the batter will be very thick and oily from the coconut oil, even while its baking. Don't fret - it helps to keep the batter fudgy on the inside and crispy on the outside! These are INCREDIBLE. Made these yesterday and used oat flour, just because. So many good healthy fats! Love that you used oat flour! I”m so glad you enjoyed it so much! !